From time to time I like to share stories of other individuals like me who were dealt problems by taking acne medicines. 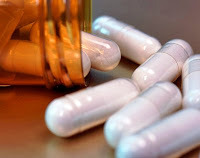 There is information you need to know, especially if you are considering taking any kind of drug to treat acne such as antibiotics or Accutaine as I once did. Today I want to share a great story from The Huffington Post that highlights the message I try to get across about the personal risk you live with by taking acne medicines. There is a definite lack of protection you have if you develop problems when you are using generic versions of drugs rather than brand names. This young man's (Gabriel) story echoes my passion of why I work so hard to help people avoid these kind of events. I have learned over the years that almost always you get what you pay for. Whether that is the food you eat or products you are using on your skin. So many clients with skin problems use products on their skin or take pharmaceuticals internally that end up causing more damage than the initial problem does. 2. Level of physical fitness. Please think about your choices... you have the power to make yourself well! This blog is full of help on each of these three areas so you can make good decisions for yourself. I'm here to answer your questions through the comments as well. I would also recommend clicking through the next link to watch this video where I break down these three items further. Together we can create the healthy reality in your life you are looking for. By the way the comment before this one was from me my e-mail is ***************** so please??!! Thanks for the comments. I actually break things down further in the free video link that is attached to this post. If you go there and watch the video, all of the information is available for you for free. Take care.